Because you are currently reading a blog about science and food, there is a high probability that you have seen or at least heard of Alton Brown: host of Good Eats and about five other Food Network television shows. 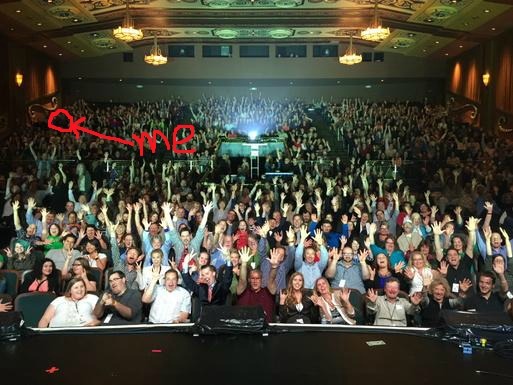 There is also a significant probability that you’re a mega-fan of Alton Brown, and if so, that’s something you and I have in common. I have been watching the bespectacled nerd-chef (I say that admiringly) since I was thirteen, and he has largely inspired my food science endeavors. 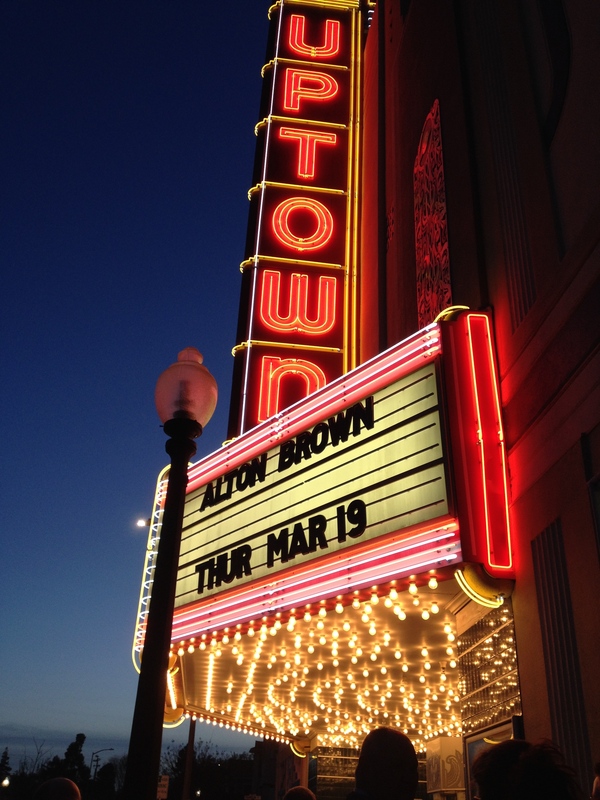 On March 19th I had the absolute pleasure of attending Alton Brown Live! The Incredible Inevitable Tour in Napa, California. Alton describes the show content as all the things he can’t do on TV, including stand-up comedy, live music, and most excitingly, showing off his insane kitchen inventions. Because even the thought of burning myself on MegaBake terrifies me, we’re going to work through the science behind his colder contraption: Jet Cream. Making ice cream is usually a simple process. Once you have your cream mixture, it simply needs to be repeatedly cooled and agitated. If we simply froze ice cream base, we’d get huge ice crystals, which aren’t necessarily bad. Dessert shops like Blockheads and Chilly Ribbons sell “Snow Cream,” that results from shaving fine sheets from a block of frozen milk or cream. But if we want ice cream, as Alton clearly does, we must continually add air to the cream and disrupt the crystallization process to make tiny crystals that are barely perceivable on the tongue. That’s why ice cream is smooth and unctuous, while frozen milk is crisp and icy. Whether you’re shaking a container of cream surrounded by ice by hand or using an industrial ice cream machine, the goal is to keep ice crystals small. Alton’s goal is no different. To make ice cream, all he needs to do is simultaneously freeze and agitate his chocolate cream. His Jet Cream machine is an extravagant way to do a huge batch all at once, and in less than ten seconds. 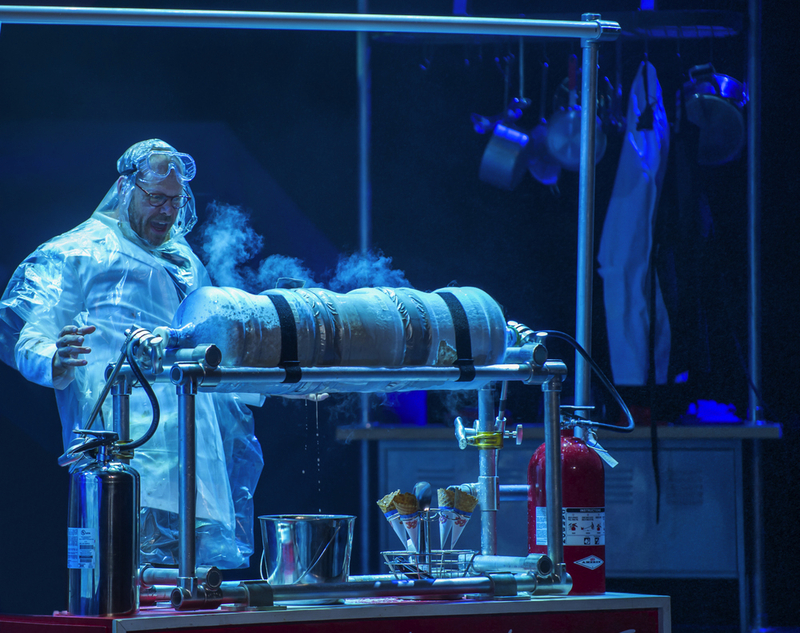 Rather than use ice and salt in a bason like pioneers did, or use liquid nitrogen like the modern gastronome, he uses compressed carbon dioxide via fire extinguisher. When the fast-flying molecules of carbon dioxide gas are compressed into the extinguisher, they are stored at a very high pressure, typically 825 pounds per square inch. A fire erupts on the stove, or you have a sudden urge for ice cream, so you pull the lever. The pressure is released; the gas flies out, and the nozzle and surrounding air become extremely cold, as tends to happen when a gas suddenly expands from a high pressure to a low pressure. The change in temperature divided by the change in pressure makes a ratio (∆T/∆P) known as the Joule-Thomson coefficient. The nozzle and surrounding air are chilled because the gas’ pressure change occurs too quickly for significant heat transfer to occur. For many gases at room temperature, as the CO2 in the extinguisher is, the ∆T/∆P ratio is positive, so a pressure drop is accompanied by a temperature drop. The molecules that were once speeding around inside the canister are now so low-energy that they form solid CO2, or dry ice. Dry ice is much, much colder than regular H2O ice because carbon dioxide freezes at -109 degrees Fahrenheit, while water freezes at 32 degrees. Colder temperature = faster crystallization = quicker ice cream. Now for the agitation: At the other end of Alton’s Jet Cream contraption is a typical water fire-extinguisher filled with chocolate cream. When this lever is pulled, a high-pressure spray of chocolate ensues. Between the two extinguishers are office water cooler jugs that act as the reaction chamber for the CO2 and cream. If the two levers are pulled exactly at the same time (synchronicity is very important in avoiding a catastrophic mess, stresses Alton), the blasts of cold and cream will collide in the coolers, providing the continual disturbance of the freezing process, as well as the incorporation of air, necessary to make tiny tasty ice crystals. So there you have it. If you want ice cream that is “so good,” and you want a gallon of it fast, Jet Cream is the contraption for you. “CO2 Fire Extinguishers.” Fire Extinguisher Guide. N.p., n.d. Web. 06 Apr. 2015. “UCSB Science Line.” UCSB Science Line. N.p., n.d. Web. 06 Apr. 2015. Are you ready? 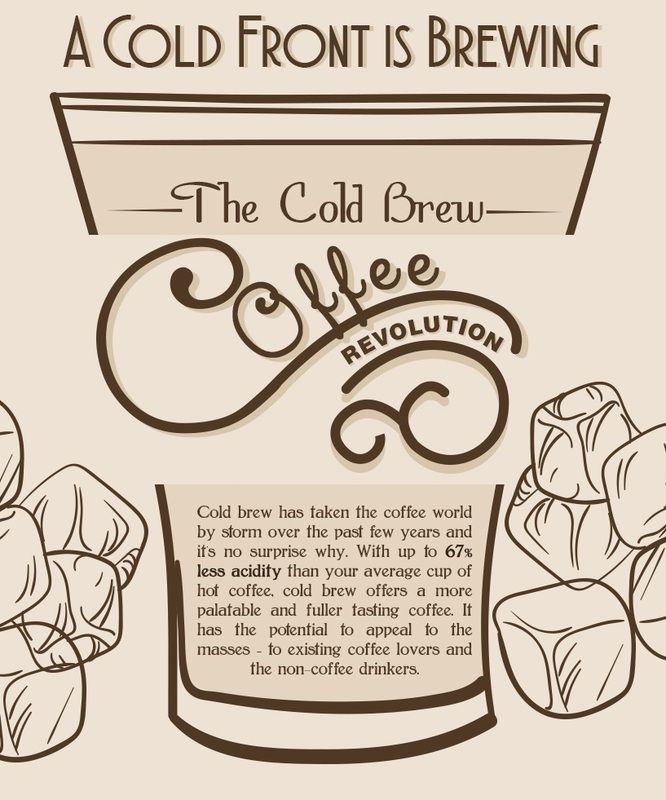 A cold brew revolution is upon us, according to Espressoworks, and they have an infographic explaining why. If you’re looking for greater and colder things, look towards Alaska, where giant vegetables grow to set world records. 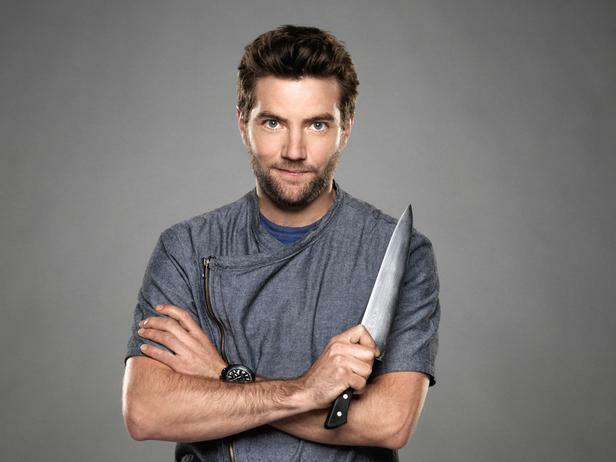 Chef Marcel Vigneron was first introduced to the public eye as the runner-up of season two’s Top Chef. Known on the show for his molecular gastronomy techniques, Vigneron has since then built upon his specialty with his own reality TV show in 2010, Marcel’s Quantum Kitchen, and competing on Iron Chef and later seasons of Top Chef. I love a good challenge and cooking is one of the only occupations that I can think of that requires you to utilize every single one of your senses while simultaneously challenging you not only physically, but mentally and creatively. It pretty much provides me with everything I would ever want out of a career and you get to perform a good deed for society and provide people with not only nourishment but also experience. Brining and curing have always fascinated me. Originally used as means of preservation, they have now become a staple technique in the kitchen for so many things. Vinaigrettes!!! A simple combination of oil and vinegar becomes so much more practical when emulsified temporarily or permanently with the addition of xanthan gum. I think science will make a positive impact on the world of food in the next 5 years through education. Every phenomenon that takes place during cooking and even in agriculture can be explained through science. The more we understand these activities and happenings the more prepared we will be to make conscious decisions regarding the future of our food. ALL I NEED IS 1 KNIFE!!!! Yuzu juice, miso paste, tofu, almond milk, fish on ice. Salt because it brings out the flavor in everything. 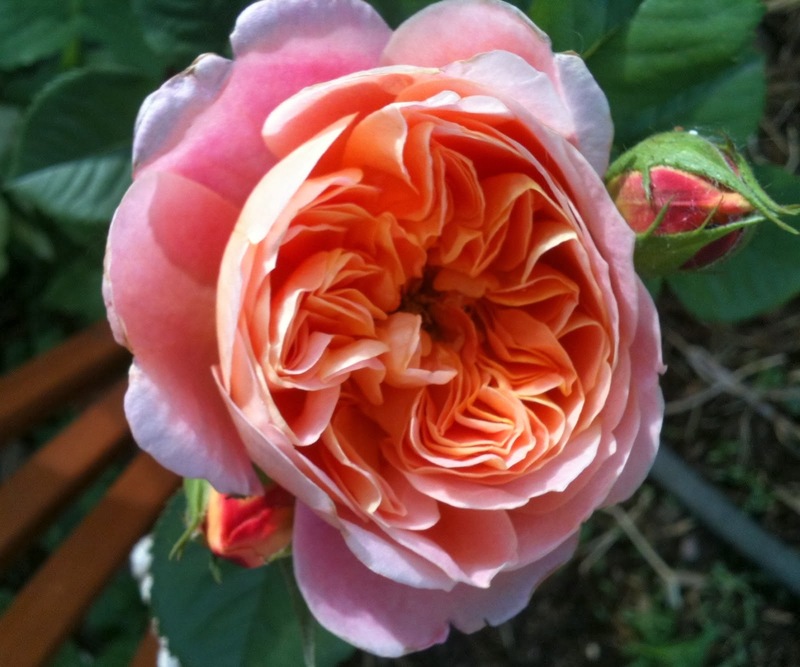 Thomas Keller’s The French Laundry. Chia seeds hydrated in almond milk with berries and nuts. 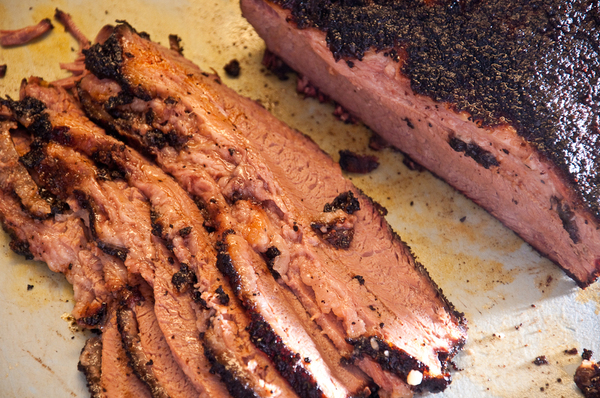 Ever put a slab of pork shoulder or beef brisket on the smoker for a BBQ, only to eventually hit “The Plateau”? Physicist Dr. Greg Blonder has the explanation for why the temperature of these meats will rise steadily for a few hours before it inexplicably stops and stalls at several degrees lower than the ideal 190°F. Fortunately, his explanation also comes with a solution. Once that dilemma is solved, check out the science that makes meat so delicious. Imagine rolling out of bed on a Saturday morning, shuffling into your kitchen, and tossing a few strips of streaky bacon into a skillet. After a few minutes, you’ll hear a delightful crackling and sizzling, soon followed by a complex and savory aroma that could lure even the most resolute of vegetarians to the kitchen. As time passes, you peek into the skillet and notice the bacon begin to brown and bubble. After an agonizing wait, the bacon has finally reached a desired color and crispness and is ready to be consumed. You eagerly bite into a strip of bacon and are met with a pleasantly smoky taste, crunch, and a melt-in-your-mouth sensation. Bacon is a delight to eat, but it’s even better when you understand the science of why it’s so delicious. There are two major factors that can explain why bacon has such a devoted fan base, with the first and more obvious factor being its aroma. Scientists have identified over 150 compounds responsible for bacon’s distinctive smell. As bacon cooks, there are a couple of different things going on. The Maillard reaction, the browning that results when amino acids in the bacon react with reducing sugars present in bacon fat, produces several desirable flavor compounds. This same browning reaction is also what forms the darkened and crunchy exterior on a pretzel or provides a stout beer with its characteristic color and taste. During this process, bacon fat also melts and degrades into flavor compounds of its own. The compounds produced from the Maillard reaction and from the thermal degradation of bacon fat combine to form even more aroma compounds. In one study, scientists used gas chromatography and mass spectroscopy and revealed many of these aroma compounds to be pyridines, pyrazines, and furans, which were also found in the aroma of a fried pork loin that was tested. Pyridines, pyrazines, and furans are known to impart meaty flavors, so what actually sets bacon apart from the fried pork loin is the presence of nitrites. 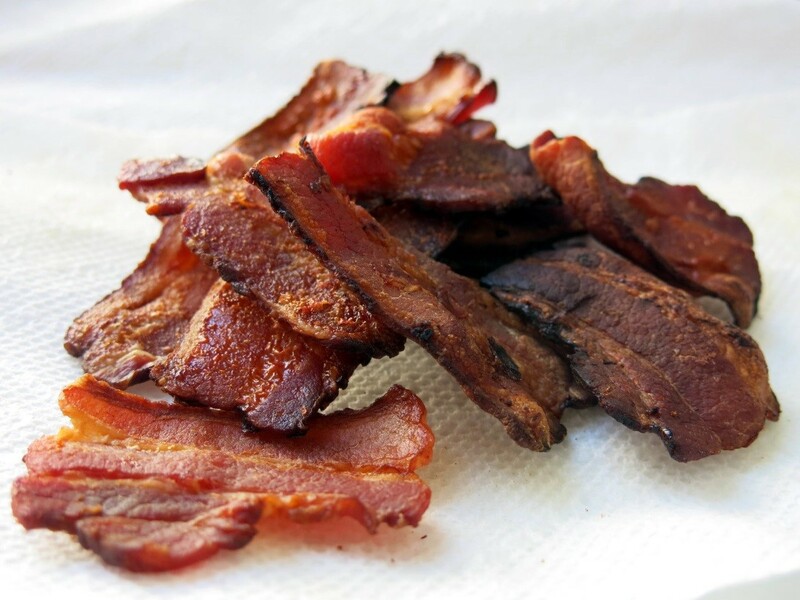 Nitrites are introduced into bacon during the curing process and are believed to react with aroma compounds in such a way that dramatically increases the presence of other nitrogen-forming compounds, including those meaty pyridine and pyrazine molecules. Ultimately, we can thank the high presence of nitrogen compounds as well as the interplay of fat, protein, sugars, and heat for bacon’s savory and unique aroma . Now imagine that you’re eating breakfast. You alternate between bites of fluffy pancake drenched in maple syrup and mouthfuls crispy bacon, and maybe you’ll also have a side of velvety scrambled eggs. Here, you have a variety of textures on your plate –which brings us to our next concept to explain why bacon is so revered—mouthfeel. Mouthfeel is described as the physical sensations felt in the mouth when eating certain foods. Bacon delivers a crunchy contrast to the softer textures found in scrambled eggs or pancakes in a mouthfeel phenomenon known as dynamic contrast. The brain craves novelty, and sensory contrasts will often increase the amount of pleasure that the brain derives from food, which is why you can find bacon as a textural accompaniment in many classic, creative, or sometimes questionable combinations. 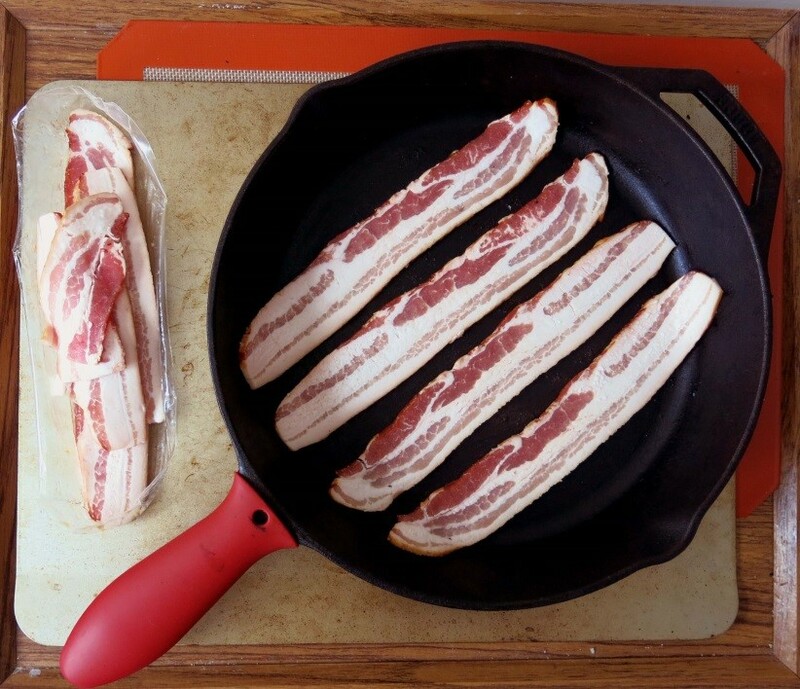 In a strip of bacon, you’ll see that it consists of lean meat that is heavily marbled with fat. During the cooking process, fat renders off leaving behind a product that simultaneously crisps and melts in your mouth when consumed, a texture combination that is rivaled by few other foods. The melt-in-your-mouth phenomenon of bacon illustrates another nuance of mouthfeel, which is vanishing caloric density. Vanishing caloric density can be blamed for why it’s so easy to mindlessly consume massive amounts of popcorn, cotton candy, or other foods that seem to melt in your mouth. Upon ingestion of these foods, it is believed that the brain is tricked into thinking that you’re eating fewer calories than you actually are. Foods with vanishing caloric density have low satiating power but high oral impact, so your brain urges you to consume more, as it finds them more rewarding . Between its tantalizing aroma and its delectable mouthfeel, it’s no surprise why bacon mania has so aggressively swept the nation. Timón, M., Carrapiso, A., Jurado, A., van de Lagemaat, J. A study of the aroma of fried bacon and fried pork loin. Journal of the Science of Food and Agriculture, 2004; 84:825-831. Witherly S. Why Humans Like Junk Food. iUniverse, Inc.; 2007. About the author: Mai Nguyen is an aspiring food scientist who received her B.S. in biochemistry from the University of Virginia. She hopes to soon escape the bench in pursuit of a more creative and fulfilling career.